Don't worry S-Works doesn't get to have all of the fun—the new Stumpjumper Comp Carbon 27.5 features the same frame with a full 11m carbon chassis and rear-end as its older brother but with a solid list of no-fuss components including a SRAM NX Eagle 12-speed groupset for an everyman's budget. Dont worry S-Works doesnt get to have all of the fun—the new Stumpjumper Comp Carbon 27.5 features the same frame with a full 11m carbon chassis and rear-end as its older brother but with a solid list of no-fuss components including a SRAM NX Eagle 12-speed groupset for an everymans budget. Our design goal for the new Stumpjumper was simple—build the ultimate trail bike one that feels telepathic. And it turns out that this feeling all comes down to stiffness. Think of it this way: when the frames telling your hands one thing and your feet another your brain gets confused with the imbalance and the bike feels unstable. In order to fix this we had to get to work on dialing-in the materials shapes and the layout. We continued down the suspension path with a custom Rx Trail Tune on both the fork and rear shock. Suspension performance is highly dependent on frame wheel and rider size so we use our Rx Tune to get each bike to land in the middle of the adjustment spectrum and this gives you the biggest possible range to fine-tune your ride. Another focal point of the tune was matching the suspension characteristics between wheel sizes—we developed a specific Rx Tune for each platform. So no matter what wheel size you prefer youll get perfectly linear suspension. Steps were also taken to make this bike easy to live with. Threaded bottom brackets make a triumphant return and we made room for up to a 3.0 tyre. Youre also free to run whatever aftermarket rear shock you want since were using standard metric shocks. We revamped the SWAT™ box too making it sleeker lighter and with more volume. And customization is furthered with a Flip Chip that lets you to dial-in your Stumpy to your riding style. Switch it from High to Low and it drops your bottom bracket 6mm and slackens the head tube by half-a-degree. Little details also jump out to surprise you like a newly designed ribbed chainstay protector that makes chain slap a thing of the past and nearly silences the drivetrain. Lastly we seriously couldnt make cable routing any easier on carbon models. Full tubes can be found throughout the carbon frame so all you have to do is push the cable and itll come out the other end. No more lazy loop hidden stashes of magnets pokey spokes or pillows to cry in. The build on this Comp model comes with a list of components that deliver undeniable quality like a 12-speed SRAM NX Eagle drivetrain SRAM Guide R disc brakes FOX front and rear suspension and Roval Traverse 27.5 wheels. The Stumpjumpers asymmetrical FACT 11m carbon fibre construction is lightweight stiff and ready to take on the trail. Its built off our 27.5 Trail Geometry so its just the right amount of both capable and comfortable. And with SWAT™ integration in the down tube a threaded BB easy cable routing and an all new chain silencer its ready for anything the trail or you throw at it. The FOX DPS Performance rear shock features our Rx Trail Tune ensuring that no matter the wheel or frame size your bike is dialed-in perfectly. SRAMs 12-speed NX Eagle groupset features a wide gear range that delivers climbing and descending efficiency in spades. 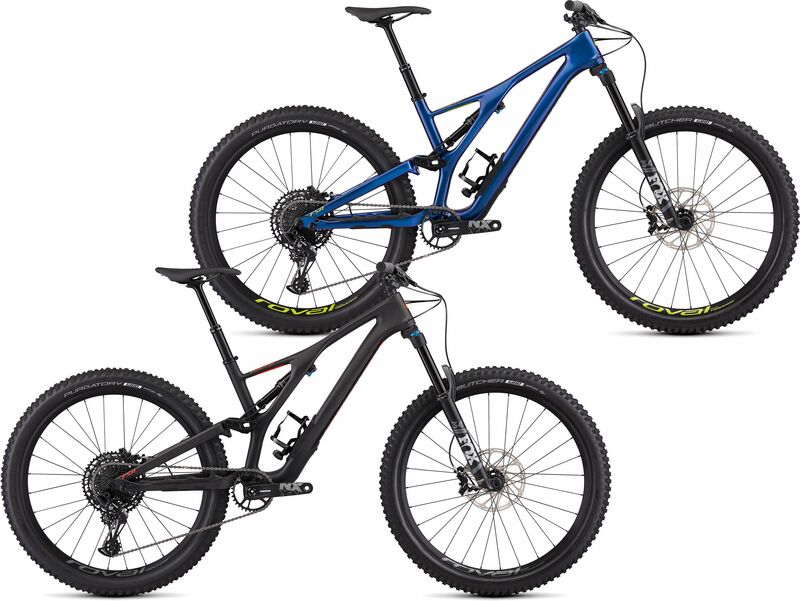 Please see below for delivery options for Specialized Stumpjumper Comp Carbon 650b 12 Speed Mountain Bike 2019.